At a conference call this morning, Taco Bell's Chief Marketing Officer, Chris Brandt, mentioned that their next-yet-unrevealed flavor of the popular Doritos Loco Line is due out in early May. Other topics covered included what's popular so far in Taco Bell's new breakfast, the reveal for the latest ad supporting breakfast, and what might round out the menu later on. The honorable mention went to the coffee, which apparently does surprisingly well (or, at least, better than expected). They might round out menu later. Taco Bell said they wanted to keep the initial menu tight for operational efficiency (i.e. quick order times and less mistakes). 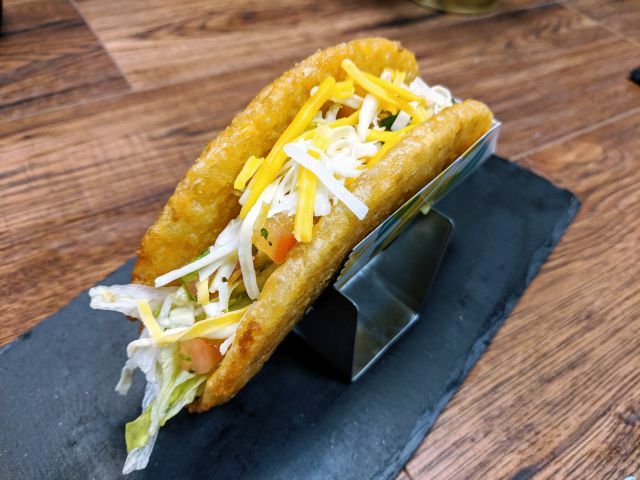 How has the Waffle Taco has changed since test? Basically, they added cheese and a box so that it'd be more portable. All the packaging was designed in mind of being photographed, since a lot of their customers like to share on social media. The next version of DLT coming in early May. Apparently, the "innovation' will be inside the shell... maybe they'll add powdered flavor to the the beef?! The new breakfast ad once again takes aim at McDonald's by showing a customer's transition from the '80s (representing McDonald's breakfast) to modern day (representing Taco Bell's breakfast). The ad runs to a parody of "Old MacDonald Had a Farm."